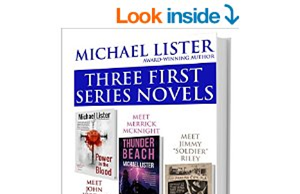 I’ve just discovered that a digital edition of three mystery novels by contemporary author Michael Lister is available for free from amazon.com. Lister writes mysteries that combine hard-boiled elements with true “whodunit” puzzles and even locked-room and impossible crime angles. His books have been praised by the estimable Jon L. Breen, former longtime book reviewer for Ellery Queen’s Mystery Magazine. The volume consists of the first novel of each of three mystery series, as the illustration indicates. I imagine that it will constitute an excellent way of getting readers interested in his other books, which I am sure is the intent behind the publisher offering it for free. I’ve obtained a copy and am looking forward to reading this and other books by Lister. You may wish to do so as well.